BIG SALE!! GEMSTONE BOTTLES BIG SALE!! Old time corked medicine bottles are filled to the brim with real polished tumbled gemstones. Choose from Amethyst, Green Aventurine, Blue Topaz, Citrine, Garnet, Mixed Gems, Moonstone, Peridot, Clear Quartz, Rose Quartz, Tiger Eye and more. A great addition to your rock and gem collection. Hurry, there are limited quantities of exotic stones. Attractive bottle full of 24k gold flakes floating in clear solution. Gold is the eternal metal of the Sun that neither tarnishes or corrodes and has long enthralled all cultures and societies. A great Feng Shui wealth cure, add to your wealth bowl or place in your prosperity corner (the far left corner from the entrance of a home or building). Made in Brazil. Old time corked medicine bottle is filled to the brim with Blue Topaz polished gemstones. A great addition to your stone collection. Made in India. Old time corked medicine bottle is filled to the brim with Amethyst polished gemstones. Amethyst promotes loyalty and devotion as well as being known historically to foster sobriety. Made in India. Old time corked medicine bottle is filled to the brim with Rose Quartz polished gemstones. Made in India. Gemstone bottle filled with high quality polished Bloodstone chips. In crystal lore, Bloodstone is a powerful healing stone and has wonderful grounding and balancing properties. Bloodstone is also known as Heliotrope and contains small "drops" of Red Jasper. Made in India. Old time corked medicine bottle is filled to the brim with Carnelian polished gemstones. Made in India. Old time corked medicine bottle is filled to the brim with mixed polished gemstones. A cute knick knack and great addition to your stone collection. Contains Amethyst, Carnelian, Tiger Eye Quartz and more. Made in India. 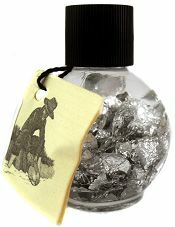 Old time corked medicine bottle is filled to the brim with Moonstone polished gemstones. Moonstone is a feldspar like Labradorite, however it is an ancient, mysterious stone, connected to the Divine Feminine and the unseen spirit. It illuminates the inner self and strengthens intuition and the subconscious dream world. Made in India. Gem bottle with Green Moss Agate which is a popular translucent Agate containing inclusions of minerals resembling moss or foliage. In crystal lore Moss Agate leads one towards agreeability, strength in endeavors and efficacy in one's pursuits. It resonates to the Virgo energies and has wonderful grounding qualities. Old time corked medicine bottle is filled to the brim with Aventurine polished gemstones. Made in India. Add White Howlite to your gemstone bottle collection! Historically White Howlite encourages healing by calming one physically and emotionally. It dispels negativity and spurs ambition toward positive goals. Colorful Leopardskin Jasper in old world gemstone bottles. Leopardskin Jasper has an array of lightly colored orbicular spots with a creamy pink or peach base. Crystal masters teach this jasper type is a "supreme nurturer and protector" which also brings everyday joy in life. Old time corked medicine bottle is filled to the brim with Red Jasper polished gemstones in rich brick red hues. Red Jasper is included in the 12 stones of the High Priest's Breastplate. In crystal lore Red Jasper is a stone of justice, assisting to rectify unjust circumstances and a potent protector. Made in India. Luxurious Black Obsidian polished stones from Mexico in corked gemstone bottle. Beautiful Black Obsidian from the volcanic bowels of Mother Earth, is a very mystical stone used since ancient times in Shamanic healing rites. Like all black power stones, Obsidian has been used to banish grief and promote wealth and happiness. Gemstone bottle filled with quality Unakite polished stones form South Africa. Unakite is a crystallized form of pink Feldspar, green Epidote and Quartz. Crystal masters use Unakite to clear blockages to physical and personal growth and speed development of one's goals. 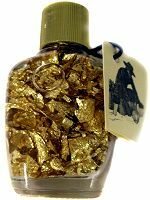 Old time corked medicine bottle is filled to the brim with Citrine polished gemstones. Citrine quartz cannot hold negative energy, but transmutes and dissipates it. Citrine is the stone of the entrepreneur, placing a crystal in one's store or office increases good fortune and assists in acquiring and maintaining wealth. Made in India. Gemstone bottle is filled with quality Chinese Rainbow Fluorite polished gemstones in green and purple hues. Rainbow Fluorite plucks order from the heart of chaos, it provides a stabilizing energy which helps relationships and individuals to flourish. Old time corked medicine bottle is filled to the brim with high quality Garnet polished gemstones. Made in India. Gemstone bottle with hard to find quality Labradorite tumbled stones from Madagascar, that have peacock colored fire and flash. Part of the Feldspar mineral family, Labradorite facilitates change in trying circumstances, plumbing the strengths of the inner self. Finally we have rare Rainbow Moonstone gemstone chips available in our popular corked medicine bottles! Rainbow Moonstone has flashes of colorful fire known as adularescence and black Manganese inclusions. In crystal lore Rainbow Moonstone is a stone of new beginnings, it illuminates the inner self and strengthens intuition and the subconscious dream world. Old time corked medicine bottle is filled with clear Quartz Crystal polished gemstones. Crystal Masters use Quartz to magnify the personal life force or Chi energy and return one to natural healing rhythms of daily life. Meditating or tuning in to the crystal energy can cleanse and nourish the mind, emotions, and physical body. Made in India. Old time corked medicine bottle is filled to the brim with Sodalite polished gemstones. In crystal lore, Sodalite helps to eliminate confusion and both clarify and stimulate the intellect to comprehend complex situations. It facilitates companionship, mutual interdependence and trust in others. Made in India. Old time corked medicine bottle is filled to the brim with Gold Tiger Eye polished gemstones. Tiger Eye harnesses the forceful, solar-charged earthy vigor whose hallmark is enthusiasm and love of life. This highly Yang stone can help release inhibition while remaining balanced or grounded with the Yin (sand/earth) energy. Made in India. We have a limited quantity of high quality South Africa Blue Tiger Eye gemstone bottles. Tiger Eye is a stone which aggressively focuses energy toward fulfilling personal desires. Crystal masters use blue stones to direct and calm intense physical and emotional energies. Unusual Russian Amazonite gemstone bottles have deep blue green coloring with the soft shimmer that make Feldspar stones so appealing. All Feldspars have soothing and calming qualities. Amazonite, in particular, fosters a deep clarity and an instinctive harmonizing which nurtures feelings of love and well-being. Sensational Lapis gemstone bottles with deep blue coloring and the familiar Gold Pyrite and White Calcite markings. In crystal lore Lapis was said to exist before time was born and admits one to the sacred mysteries, it contains the mineral Lazurite which has been mined for over 5000 years. Exceptional translucent Pink Opal polished stones from the Andes of Peru in classic gemstone bottles. Pink Opal has a soothing combination of pink and lavender swirls. This stone has been associated with rebirth and awakenings. It's possessor is believed to enjoy heightened creativity and spirituality after being released from past negativity. Corked gemstone bottle filled with rare Prehnite tumbled stones from China with translucent green hues, yellow overtones and Epidote needles. Prehnite is considered a master healing stone which "heals the Healer". It promotes unconditional Love and enhances preparation for critical or known upcoming events. Rare Sunstone gemstone bottles with bright, sparkling orange and cream India Sunstone that have brilliant reflections. In Crystal Lore Sunstone is used to increase vitality and alleviate stress. The Ancient Greeks believed Sunstone represented the Sun god and brought life and prosperity to it's possessor as well as good luck in games of chance. Superb quality Black Tourmaline polished stones from South Africa in collectible gemstone bottle. In crystal lore Black Tourmaline has powerful energies both repelling and protecting from negativity. It has been used to increase vitality and guard against depression. Genuine Aquamarine tumbled stones now available in quaint corked medicine bottle. Aquamarine is a variety of Beryl, also known as Emerald when it appears as green crystals. Historically Aquamarine is a stone of courage and accelerates the intellectual and reasoning processes leading to better assimilation of the knowledge sought. Spectacular corked medicine bottle filled with Fancy Jasper that is bursting with colors and patterns that only Nature can conceive. Jasper has been a sacred stone for kings and shamans, believed to ward off negativity and provide protection. Made in India. Old time corked medicine bottle is filled to the brim with Peridot polished gemstones. In crystal lore Peridot uplifts the spirit with warmth and friendliness as well as being used for protection and cleansing the chakras. Made in India. Old time corked medicine bottle is filled to the brim with Turquoise polished gemstones. Made in India. 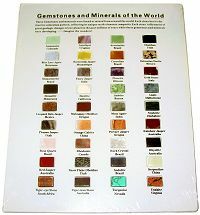 This educational Gem Stone Collection is a useful tool for beginners and experts. 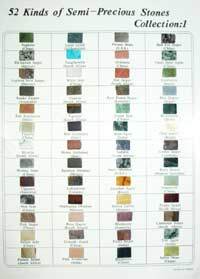 There are 52 popular polished gem stones included this guide. Primarily a reference, it will be a handy accessory when identifying stones in your collection. The individual stone pieces are 5/8" x 3/8" with the gem stone name and country of origin.